Now that the position of Australian Prime Minister has changed hands from the slow/stupid nation wrecker (Julia Gillard) back to the fast-talking and devious nation wrecker (Kevin Rudd), it's a good time for a reminder of what Kevin Rudd is all about. We know that 45,000 boat people have arrived since Rudd softened our border-security policies. And while he is wasting billions on boat people, his party has cut billions from defence spending. And we know that his Labor Party can't balance a budget if their life depended on it. But this is fairly typical as far as left-liberal parties go. Apart from those obvious failings, however, Rudd can appear hard to understand. He presents as an intelligent, articulate, hardworking, friendly, albeit nerdy, bureaucrat. So you can be forgiven for thinking that Rudd is a safe pair of hands to rule the country. But he is not. Alas, when you get to the heart of the man, you find an ideologically-driven lunatic of the highest order. When it comes to open-border, diversity-loving, transnational-progressive freaks, Rudd leads the pack. Fundamentally, he does not believe in Australia, and if he had his way, he would open our borders to millions of Asians with his grand delusion of an Asia-Pacific Union. True, Rudd will have learned from his past mistakes e.g. 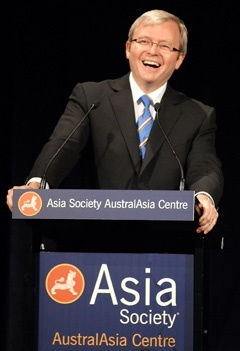 blurting out his desire for a big Australia (in terms of population) and his terrifying "It’s time to build an Asia Pacific Community" speech. But while he may temper his desires, don't expect him to change deep down. So here are a couple of quotes that get to the heart of the man. You can expect Rudd to maintain the same goals, except that he'll be more subtle and moderate about his grand delusions. So there you go. He does not believe in Australia and he would open our borders to millions of Asians tomorrow. I read one estimate that 20 million Asians would move here under an Asia-Pacific Union. Rudd is barking mad. Nobody but Rudd and a few fellow lunatics want such open-borders idiocy. But yet he persists as if it's for our own good. File under: man v. nature.